My notes from the Voices of Freedom Panel on which I spoke Saturday. 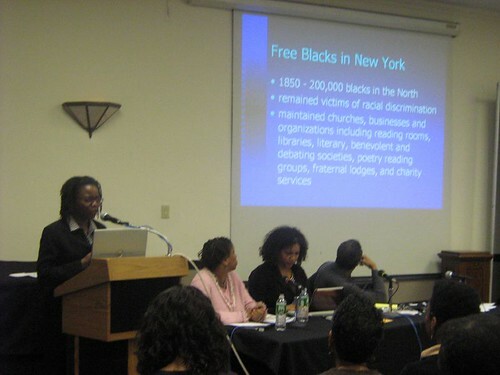 The Panel was subtitled: "The Role of Black Newspapers from 19th Century Weeksville to the Present." My job was to bring the blogger's perspective to that conversation. From Left to Right: Dr. Pat Young, Allison Keyes, yours truly, David Greaves. Weeksville Heritage Center Exec Director Pam Greene introduced the panel. 2:23 pm The moderator Allison Keyes is being introduced. She is a longtime journalist who works for NPR. She now has the mike and is explaining that she became a journalist to tell stories about the black-american community. 2:24 pm She is introducing my co-panelist Dr. Patricia Young who is a phd and education professor. 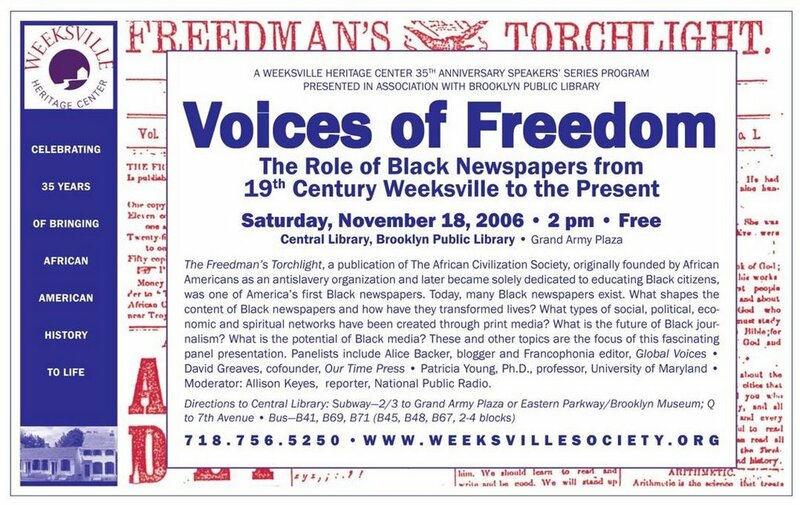 She will talk about the Freedman's Torchlight, the historic African-American Weeksville paper. 2:25 She is introducing David Greaves, publisher of Brooklyn paperOur Time Press, a Brooklyn Native. 2:26 She is introducing me. I realize after the intro that kiskeyAcity can be hard to pronounce for non-Haitians who don't know the meaning of Kiskeya. (Which by the way means "mountainous land" in Arawak/Taino and is, along with the word "Haiti" a name given to the country by its Taino/Arawak natives. )Either that or Ms. Keyes --a consummate radio personality and professional enunciator-- was playing a practical joke on me when she mispronounced kiskeyAcity. Maybe a little bit of both? 2:48 David Greaves is up. Our Time Press is a community paper and is more likely to publish church basement events than those happening at the Marriott Marquis. Small Black papers create networks between small business owners and local readership. He says Rupert Murdoch now owns even local paper Caribbean Life (!!!) and they are posing problematic competition to papers like Our Time Press because they are so much better financed. Future of black print media is grim unless there is black financing, he concludes. 3:08 I come on and talk about what I do at Global Voices and at kiskeyAcity, namely that I offer more complex facets of Haiti and other francophone African, Caribbean and Oceanian countries by amplifying the voices of their bloggers. I talk a little bit about the 3-part Kevin Sites Watch I did earlier this year. I showcased bloggers I cover for Global Voices such as Le Blog du Congolais (DRC), Pierrot Dupuy (La Reunion) and Le Blog de Moi (Martinique). What Future for Small Black Presses? The Q&A started out with lots of questions about what blogging and blogs are. The audience was by and large made of boomers and some seniors so I was asked to provide the nitty gritty. Then the discussion veered to the problems of small black presses and their (grim) future. There were questions about blogs too, of course and their accuracy and reliability. I explained that blogs, like the mainstream press should be read with a critical eye but that ultimately they offered a more varied set of voices and perspectives that can supplement or at times supplant mainstream media. I found it a bit regrettable that some seemed to want to oppose print to blogs. No need really. The internet can actually help the dissemination and availability of historic print publications. Case in point: Marcel Salnave Jr. who, from Haiti, uses his blog Parlons Peu to publicize his father's journalistic writings from the 40s and 50s. I mean, could he really get the same exposure through print, especially with a Haiti-based publisher? Doubtful. His blog makes him searchable on google and hence accessible to the average Joe of any age googling from home. Can a copy or two of his Haiti-published book lingering in one or two specialized collections in the United States and France have the same reach? 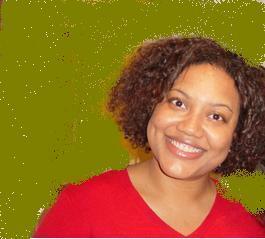 My website, www.AfriClassical.com, is not part of the Black press and is not a blog, but I am taking the liberty of making a post because many of the 52 composers and musicians of color who are celebrated at my website are either Creole Romantics from New Orleans, other African Americans, or people born in Cuba, Guadeloupe, Haiti or Jamaica. Still others are from Africa or Europe. I knew I had to make myself heard when I learned of the great composer, violinist, conductor and fencing champion Le Chevalier de Saint-George (1745-1799) about 10 years ago. His mother was a slave on his father's plantation on Guadeloupe. His talents in fencing and classical music earned him access to the highest levels of French society before the Revolution, but he fought on the side of the Revolution, and heroically commanded 1,000 volunteers of color. Still, he was virtually a non-person within four years of his death. His music was no longer played after Napoleon ordered the reinstatement of slavery in French colonies in 1803. My page on Saint-George tells of the free Black citizens of Guadeloupe who were outgunned by French troops but were so unwilling to return to slavery that hundreds blew themselves up in a gunpowder warehouse. In spite of his role in the French Revolution, Saint-George is virtually absent from History textbooks in North America, and his many fine works of music are still generally treated as novelties associated with Black History. I provided some research assistance for "Le Mozart Noir", the 2003 documentary on CBC Television in Canada, so my name is in the credits. A DVD was released in 2005. The Saint-George page of AfriClassical.com mentions two of the websites which sell it. The DVD has gorgeous music played by the Tafelmusik Baroque Orchestra. Eleven compositions of Saint-George are briefly sampled at my site. I hope members of the Black press, as well as bloggers interested in Black issues, will bring some of the content of the site to the attention of their readers. Thank you for your post. I know several people who will be happy to peruse your site. You will be happy to know that I read a lot of Guadeloupean and French Caribbean blogs for my work with Global Voices and that they are talking quite a bit about Chevalier de St Georges these days both in the Caribbean and in their communities in France. I think their work has gotten him a lot of buzz in France. Thanks again and hope to see you back here.